I made this last weekend for breakfast and the family loved it. Because we are just a family of three, it made enough for us to eat on it all week for breakfast. It heats up very well in the microwave. 1. Heat olive oil in a large skillet. Add the onion and potatoes. Cook for about 10-15 minutes, until potatoes are just fork tender. Stir in the sausage, season to taste with salt and pepper and cook an additional 5 minutes, until browned. 2. 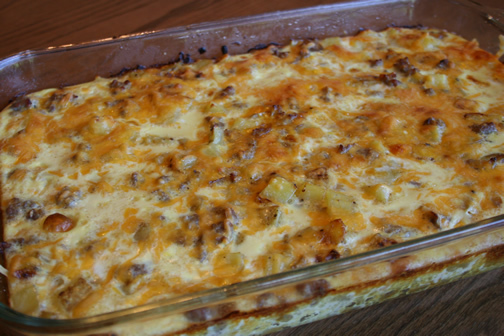 Cool the potato and sausage mixture and pour into a lightly greased 13×9 casserole dish. 3. Combine the eggs, milk, cumin and garlic powder in a bowl and whisk together. Pour into casserole dish and top with shredded cheese. Bake immediately at 375 degrees for 35-40 minutes, until egg is fully cooked. 4. Cool for 5 minutes before slicing and serving.